What is more Fourth of July than a thick, juicy steak on the grill, with a bottle of big, bold red wine? That’s what we had for our Independence Day feast, and we loved it. We don’t have steak that often at our house. It may be because as we get older we’re eating lighter meals. But when we do have steak, we enjoy the heck out of it. And as meat prices continue to climb, steaks may become an even rarer treat. 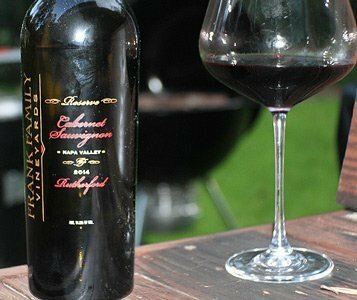 For wine I chose a Frank Family Cabernet Sauvignon Reserve from Rutherford in the Napa Valley. I like a lot of red wines, but there is none better than the Frank Family Cab. Winemaker Todd Graff had great grapes to work wth and then used every bit of his magic to produce this incredible wine. It is a gorgeous deep purple in color, with inviting aromas of blackberry, cedar and coffee. The first sip goes down easy and then the flavors just keep rolling in. I tasted blackberries, cherries, red currants, some licorice and some spice. It has a rich, full mouthfeel, with a lingering, elegant aftertaste. This is a superb wine. The grapes are 91 percent cabernet sauvignon, 4 percent petit verdot, 3 percent cabernet franc and 2 percent merlot, all from the Rutherford region of Napa Valley. 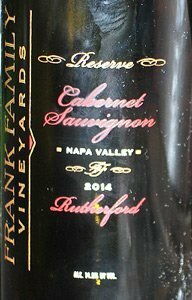 The Frank Family Reserve Cab is sourced from a few prime vineyards in the Rutherford AVA. Rich Frank’s Winston Hill is located in the eastern side of the Napa Valley’s Rutherford appellation along the Vaca Mountain range. The hand-terraced vine rows have southwestern exposure and consist of well-drained volcanic and sandstone soils that rise nearly 500 feet from the valley floor. Frank’s Benjamin Ranch is right across the Silverado Trail from Winston Hill. The ranch spans 87 acres with 70 acres planted with vines. The Benjamin Ranch Cabernet Sauvignon adds depth and the classic “Rutherford dust” character to the Rutherford Reserve. A handful of their closest neighboring vineyards are chosen to finish out the blend. The wine was aged 20 months in 50 percent new French oak and 50 percent in once-filled French oak barrels. Frank Family produced 1,000 cases. Robert Parker rated it 94 points. While I don’t put much stock in wine rating numbers, when Parker rates it in the mid-90s, you know the wine is a blockbuster. The important thing to know is all the grapes come from Rutherford. There is something about the “Rutherford dust” that gives an incredible character to the wine. When wine folks talk about “Rutherford dust” they’re not talking about actual dust. It is more a reflection of the terroir that makes Rutherford wines special. There is a character of tannins in wine grown in Rutherford that is sort of like a cocoa powder character. What I get from Rutherford wines is complexity and finesse. The area is a later ripening site in the heart of Napa Valley. The grapes ripen slowly, allowing them to develop that complexity and finesse. However you define it, Rutherford dust means something special in a wine. Winery: Frank Family Vineyards is one of those wineries where I could drink their wine every day, because the wine is so good and because they make such a great variety of wine. The story of Frank Family Vineyards is almost like a Hollywood movie, which is appropriate because founder Rich Frank was a Disney executive in Los Angeles when he got interested in wine. He started visiting the Napa Valley on weekends in the 1980s before buying the historic Larkmead Winery, which opened in 1884. He bought the winery with Koerner Rombauer in 1992 and bought out Rombauer in 2007. The stone building from the original winery is on the Registry of National Historic Places, and is now used for parties and receptions. All the winemaking facilities are state of the art. The winery also has one of the best tasting rooms in the state. The staff keeps it loose and fun, but they also teach you about wine. The tasting room moved from a ramshackle old metal building to a beautiful 1930 Craftsman home a few years ago. There are several different rooms to use depending on the type of tasting you want. The winery also is a fun place to have a picnic. I have been there many times, and have always had fun. When people ask for a recommendation of where to go for a wine country visit, this is my first recommendation. Superb winemaker Todd Graff makes a range of varietals, including Cabernet Sauvignon, Pinot Noir, Zinfandel, Chardonnay, Petite Sirah, Sangiovese and some incredible sparkling wines. The wines are made from 450 acres the family owns on parcels scattered throughout Napa Valley. Frank Family has continued to grow, gaining fans all over the world. Their latest expansion is in the Far East: China, Japan, Thailand, South Korea, Hong Kong and Singapore. Rich Frank now also runs his own entertainment company, Prospect Park, which develops television projects. Frank Family has received Napa Green certifications for both its vineyards and its winery in the Napa Green Certified Winery and Napa Green Certified Land programs. The program is designed to conserve and improve the quality of the environment through vineyard-specific programs. Certification also means the winery has minimized energy and water use, waste and pollution. We all loved this All-American meal. Goes with: We had this powerhouse wine with four thick Porterhouse steaks that were on sale at Fresh Market. The meat was magnificent, which it had to be to stand up to the Frank Family Reserve Cab. Because there was so much meat, we didn’t need much else. Michael and I had baked potatoes and Teri and Micheala had a baked sweet potato. We also had sauteed onions, creamed corn and cut up veggies. To cook steaks I get the heat as high as I can on my big Weber charcoal grill, usually about 500 degrees. Then I sear the steaks on one side for 3-4 minutes and repeat on the other side. This gives the meat nice dark grill marks. If you want to get fancy you can turn the steak 45 degrees halfway through the searing. That gives you cross-hatch grill marks. After searing, I move the steaks to a cooler part of the grill and cook another 5-7 minutes. This time the steaks came out perfect, seared on the outside and red to pink on the inside, with plenty of juice. Before putting the steaks on the grill I dusted them with Morton Nature’s Seasons and some Olde Thompson steak & hamburger seasoning. When I served the steaks I put a dab of butter on top of each one to add to the flavor. The food was delicious, and the wine made the meal even better. I asked the butcher what made a Porterhouse steak so special, because I have always heard it is the best of the best. Basically, it’s an over-sized T-Bone. If you took out the bone you would have two steaks, a tenderloin steak and a top loin, or New York Strip steak. The Porterhouse is generally cut thicker and has much more of the tenderloin than the T-Bone. 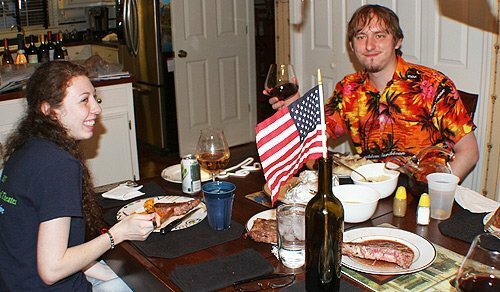 Micheala and Michael enjoyed the July 4th meal. 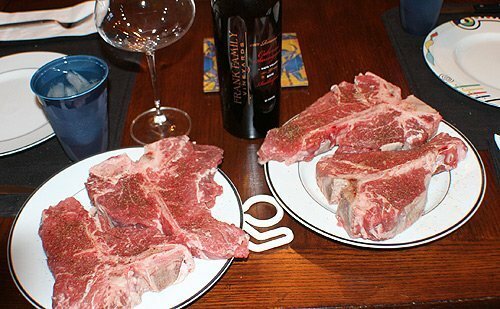 A Porterhouse is the perfect steak for two people to share, but I didn’t know that when I bought four. Oh well, they make great steak sandwiches a day or two later. 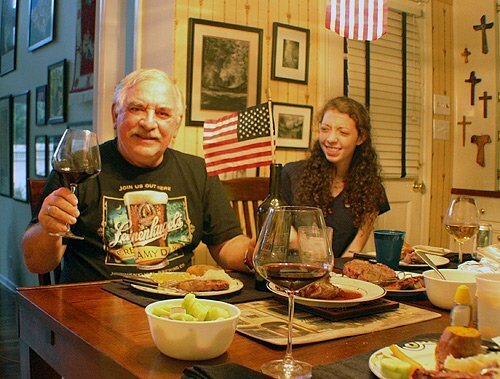 The Frank Family Cab is one of those rare big wines that is great for sipping, but also pairs well with food. You need a hearty meat dish for this wine, but it is soft and supple enough to pair with meat on the grill, beef stew, wild game, or strong cheeses. If you are a member of the Frank Family Wine Club you get 10 percent off the price of this bottle. More reasons to be proud to be an American. Happy birthday, America.